This isn’t so much a recipe as a guideline. 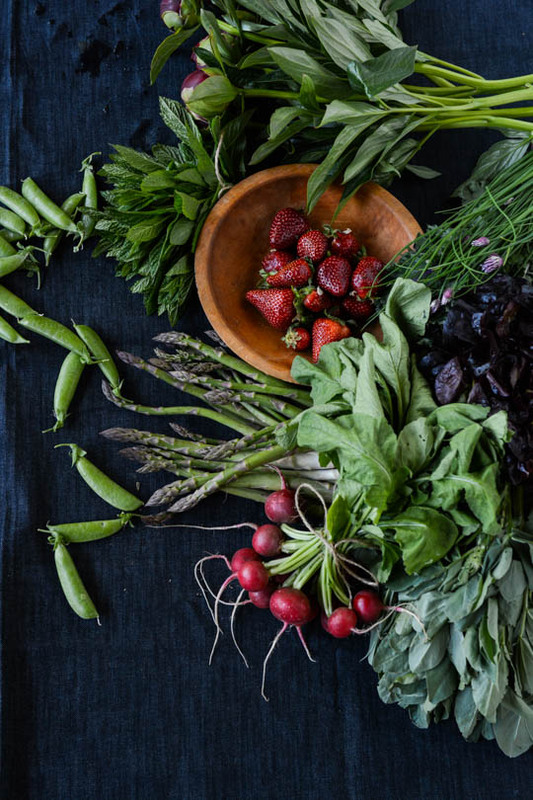 Feel free to journey to your market and see what is fresh, what looks good and don’t be afraid to ask for a taste. I’ve found some of my favorite ingredients at my local market. I love wandering the stalls, creating dishes in my head as I go. I highly recommend going to the market with an open mind. I let what’s fresh and interesting dictate what my meal plans are going to be. It requires a bit more thought but I always end up with a much better dish by going with what’s in season. Supporting your local economy is always a worthwhile endeavor and I must admit that I will always choose local over organic. 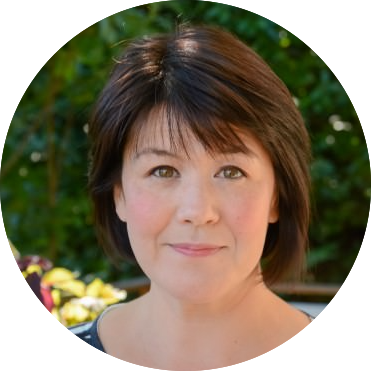 It can be cost prohibitive for small growers to become certified organic but if you ask about their growing practices you will find that a lot of independent farms avoid using pesticides and are GMO free. Buying locally also ensures a smaller carbon footprint and more likely sustainable vs. an organic product coming from Mexico or California. 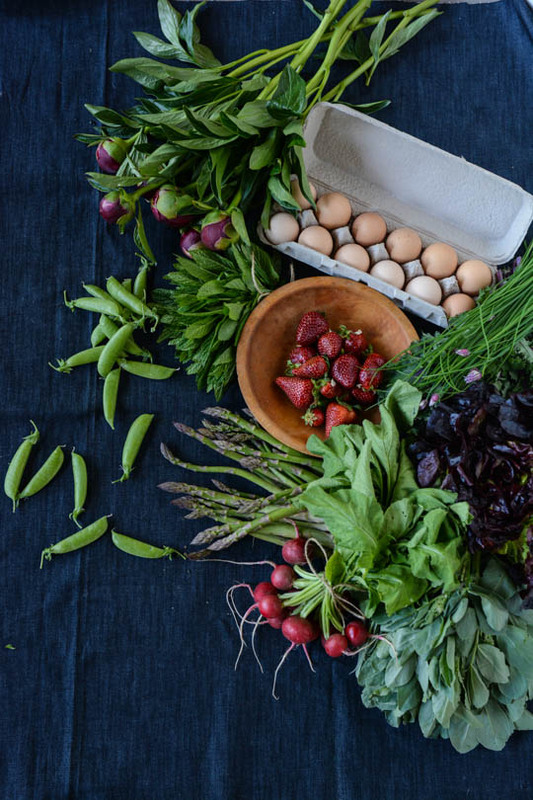 Shopping at a big box retailer typically results in less than 10% of every dollar spent remaining in the community whereas by supporting local farms up to 70% or more continues to circulate in the region when you shop local. This week I picked up an amazing salad blend with spicy flowering arugula, mustard and pea tendrils. 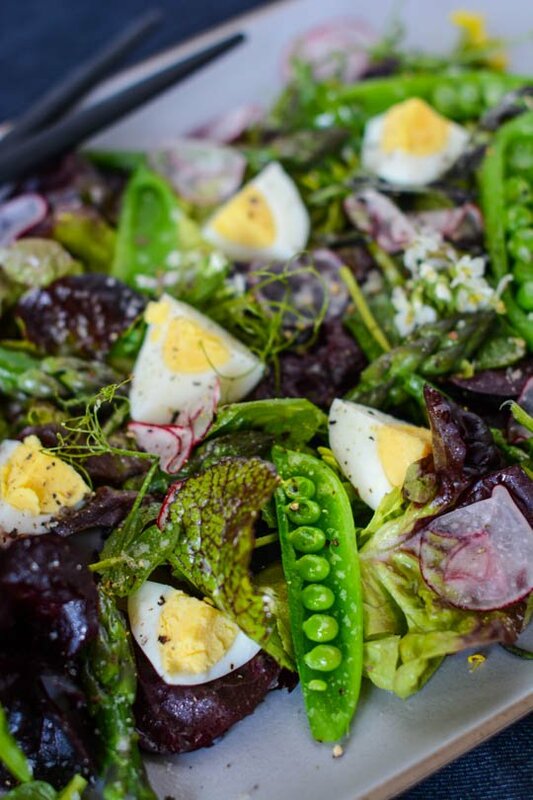 Snap peas and asparagus are in season right now and they are one of my very favorite salad additions. It just takes a quick blanch and a dip in an ice bath and they add a delicious crunch and texture. 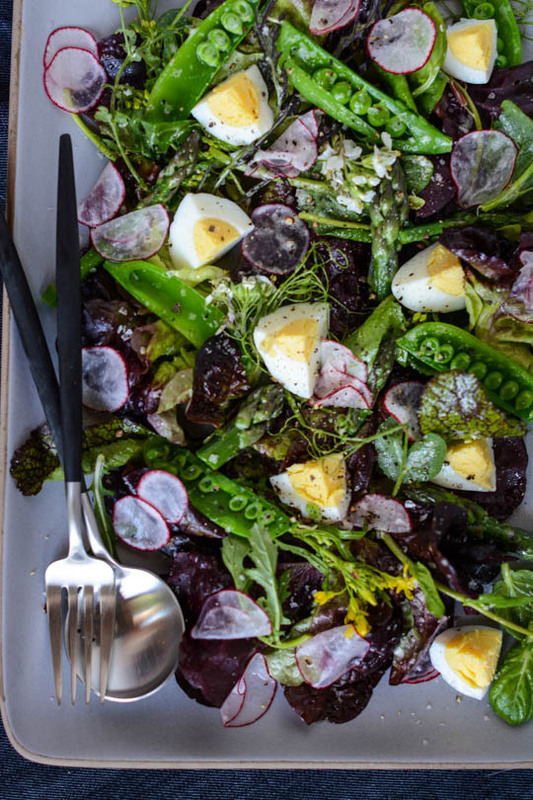 Some farm fresh eggs, young asparagus and some spicy radishes and my new favorite salad was born. I kept the dressing really simple so the flavor of the delicate vegetables are the star. Fresh peas would also be a great option or some baby turnips would also add a lovely crunch. Heavily salt a medium pan of water and bring to a boil. Prepare an ice bath by filling a large bowl with 2 cups of ice cubes and filling with cold water. Trim the snap peas and asparagus. Remove the strings from the peas and cut the asparagus into 2-inch pieces. Once the water comes to a boil add the peas and cook for 30 seconds to one minute. 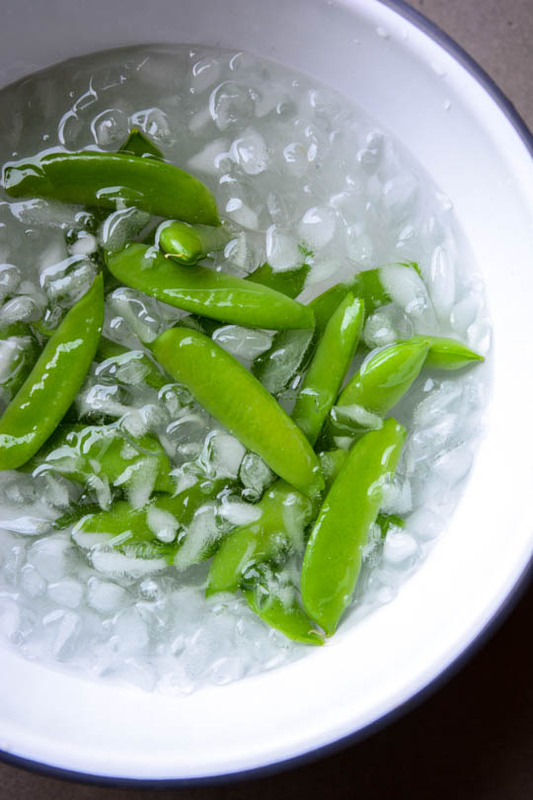 Remove the peas and immediately submerse them in the prepared ice water bath. Let cool and set aside on a paper towel to drain. 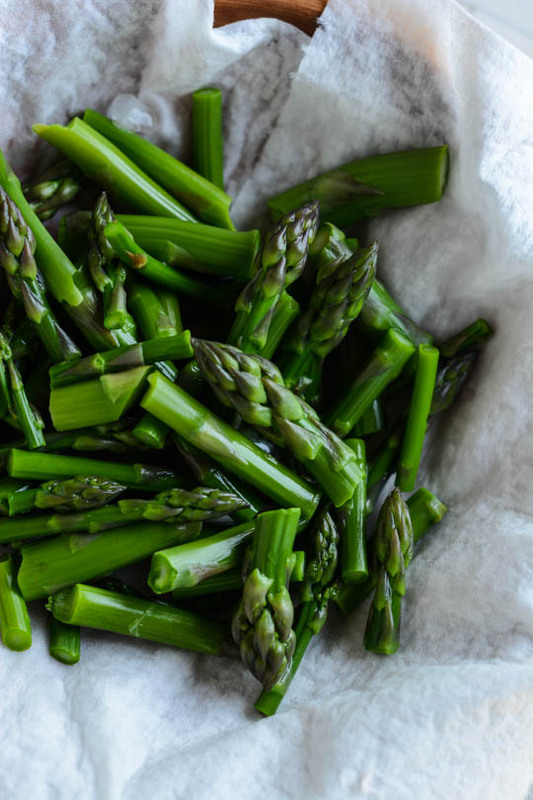 Repeat the same process with the asparagus. Cut the snap peas in half lengthwise and add to a large bowl. 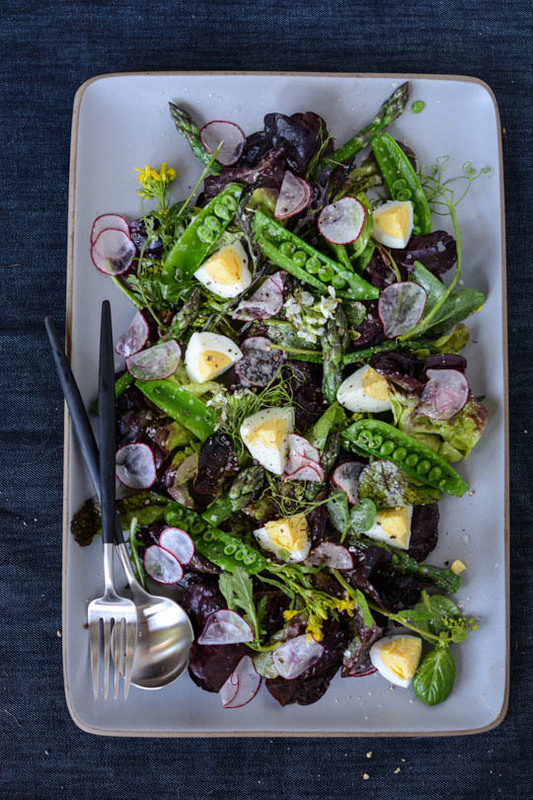 Add the mixed greens, asparagus, radishes and mint. Add the lemon juice and olive oil to the bowl, season with salt and pepper and toss lightly to combine. Divide the salad between four plates, cut the egg into eighths and place one egg per serving. This look so good and delicious, Tina! I’ve been eating a version of this everyday this week and I still haven’t gotten tired of it! Happy Friday!